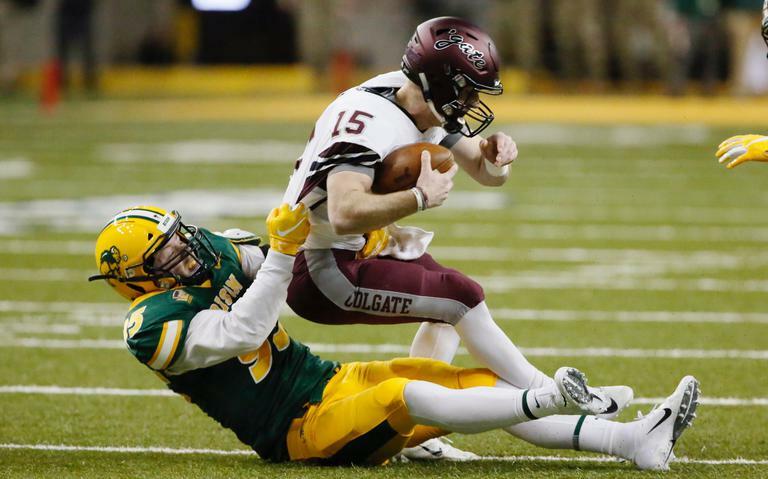 FARGO, N.D.— Top seeded North Dakota State advanced to their eighth straight Division I FCS semifinals with a 35-0 win over eighth seeded Colgate before 16,404 fans at Gate City Bank Field at the Fargodome. In a match-up of the top two scoring defenses in all of Division I FCS, NDSU was the stronger of the two. Colgate came in as top defense before this game. NDSU (13-0) started where it left off on offense in the 52-10 win over Montana State in last week’s second round. Starting from its 4-yard line after a Colgate punt, it took only four plays for the Bison to go 96 yards. Running back Ty Brooks scored on the final play on a rush from 26-yards out and it was quickly 7-0 Bison. The Raiders then showed why they were such a highly ranked defense until the later stages of the second quarter. The Bison made took a 14-0 lead on a two-yard touchdown pass from Easton Stick to tight end Ben Ellefson with 2:27 remaining in the half—the last points before the halftime whistle. The Bison put the Raiders into a huge hole scoring the first two times they had the ball in the third quarter. First, a 10-yard touchdown pass from Stick to Darrius Shepherd made it 21-0. The catch moved Shepard into second on the NDSU career list with 179 receptions. Then after the NDSU defense held the Raiders to three plays-and-out, Bruce Anderson scored on a 42-yard run to put NDSU up 28-0. “That opening drive of the second half put an end to the game,” said head coach Chris Klieman. Bison freshman Phoenix Sproles added a 6-yard touchdown catch in the fourth quarter, the first in his career to give the final score of the game at 35-0. NDSU pitched their second ever shutout in the Division I FCS playoffs. The other was against another Patriot League team in Lehigh, when they won 24-0 in the quarterfinal round in 2011. Colgate’s offense had little success, as the Raiders finished with 157 yards and went 1-of-12 on third down conversions. Stick went 14-19 for 205 yards and 3 touchdowns, while Anderson had 12 attempts for 124 yards and 1 touchdown. to lead the Bison offense. Derrek Tuszka had 2.5 sacks and Jabril Cox lead the team with six tackles to head the Bison defense. NDSU moves on to host the Division I FCS Playoff semi-final against the winner of South Dakota State and Kennesaw State.